Youth Outreach is a program that engages St. Louis’s underserved children and teenagers by offering a creative, constructive space with passionate instruction. Created in 2015, it is designed to cultivate the River Styx values of creativity and literacy. Currently, the workshop is partnered with CVPA and we are pursuing additional partnerships. The students who participate in the these workshops come from all areas of the Greater St. Louis Metro Area. A majority of the students are below reading level by national and state standards. The primary focus of the workshops is creativity, literacy, and fun! Workshops are designed to be accessible and inspirational to students of all levels, by incorporating a variety of writing genres—poetry, memoir, spoken word, and fiction—and writing exercises like free writing, writing from prompts, revision, and open mic readings. Workshop partnerships are designed around the needs and interests of each specific community. We are always looking for new partners in the community. Central Print Studios, the non-profit extension of Firecracker Press, is a favorite partner of our youth outreach students. 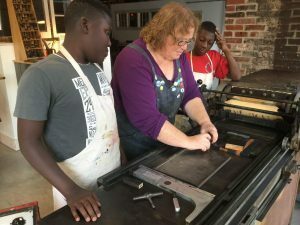 During field trips, students learn the craft of printmaking and have the opportunity to create postcards, chapbooks, and broadsides using antique printing presses. This experience allows students to see their work transform through publication. Youth Outreach partnered with Gateway180 Homeless Shelter in 2015. Gateway180 provides the temporarily homeless with safe, supportive housing services. The afterschool program empowered children ages 7 to 14 to express themselves creatively and to discover their unique voices. Youth Outreach partnered with North Campus’s Sanctuary location. 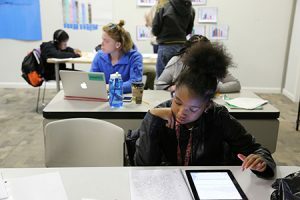 North Campus works with students in the O’Fallon Park, Penrose, and College Hill neighborhoods to offer after-school tutoring, meals, and enrichment. Students ages 12 to 14 receive one-on-one time with workshop leaders to improve their writing and public speaking skills. Throughout the school year, River Styx staff members love to visit high schools in the Greater St. Louis Metro Area. These visits can include a writing workshop, readings, lectures, and Q&As. In 2016, youth outreach workshops had the pleasure of visiting Central Visual and Performing Arts High School, Edwardsville High School, Jennings High School, Ladue Horton Watkins High School, Parkway South High School, Pattonville High School, and Windsor High School. Invite River Styx to visit your classroom! I want to donate my time and volunteer for this workshop!